John James Audubon. Top, TPC Louisiana. was clearly inspired by the beauty that he saw during those 23 months because at least 80 of the paintings included in the book were created in Louisiana. As a way of honoring someone who appreciated the area so much, the Audubon Golf Trail was established in 2001. Fifteen courses make up the Trail and each one is or has plans to become a member of the Audubon Cooperative Sanctuary, a program “dedicated to protecting the environment and preserving the natural heritage of the game of golf.” This past May, I was fortunate to play six of the courses on the Trail. Each was enjoyable, pleasing to the eye but also quite different. Just minutes from downtown New Orleans, on St. Charles Avenue, is Audubon Park Golf Club. Originally built in 1898 (probably consisting of only a few holes), this golf course is part of the very popular Audubon Park that also includes the Audubon Zoo. (Obviously, the state really likes this guy.) Nearby to both Tulane and Loyola universities, Audubon Park GC is a challenging but fun layout that plays to a par of 62. 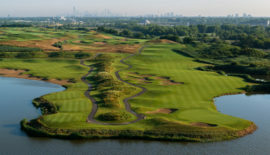 Three tees are available – measuring between 4,420 yards and 3,341 yards – and water is in play on nine of the 18 holes. Set on rolling terrain that is dotted with one-100-year-old oak trees, Audubon Park GC is tougher than you may think. Plus, it’s the only golf course in America that’s accessible by streetcar. Culinary note: should you play here in the morning, consider the grits and beef breakfast dish, known as grillades, that’s available inside the club’s restaurant. To my surprise, it was quite good. 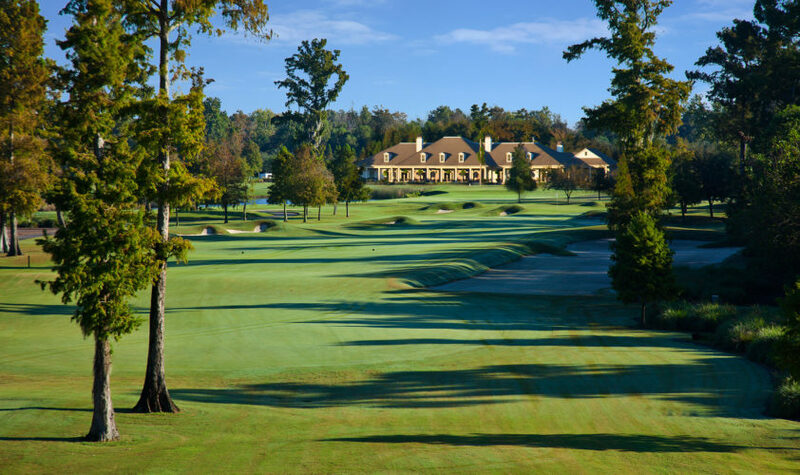 Fifteen miles southwest of New Orleans, in Avondale, you’ll find one of the most enjoyable courses a serious or recreational golfer can play anywhere: TPC Louisiana. 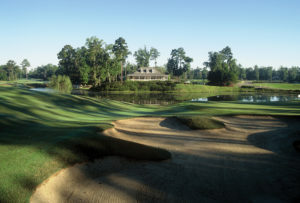 Opened in 2004, TPC Louisiana was designed by Pete Dye with the assistance of former PGA Tour players Steve Elkington and Louisiana native Kelly Gibson. In addition to being fair and fun (which I can’t say for some of the other Pete Dye courses I’ve played), another reason to experience this beautiful layout is the fact that it’s the host venue of the Zurich Classic of New Orleans on the PGA Tour each year. From the tips, this challenging tract measures a hefty 7,425 yards. Thankfully multiple tee combinations are also available that measure between 6,931 yards and 5,122 yards. To make it even more exciting, water is in play on seven of the holes and there are more than 100 bunkers to contend with. Oh, wait, did I mention there are alligators lurking about? Trust me: pick the proper tees and you’ll find this Tour stop to be very playable. In addition to its many fine golf courses, Louisiana is known far and wide for its food — and I don’t just mean seafood. One favorite you can’t find anywhere else is a sausage called boudin. Pronounced “boo-dan,” this tasty item is a mixture of pork (or seafood), rice, onions, green peppers and seasonings. It’s so popular here that it’s eaten for breakfast, lunch and/or dinner. Some people like it stuffed into a pastry, others like it in the form of a sausage link with a side dish. As for me, I love the boudin balls. They’re breaded, deep-fried and served as an appetizer. The Bluffs at Thompson Creek. Designed by Arnold Palmer. any other course on the Audubon Golf Trail. Except for the first hole — which I felt was too hard for an opener — the course is a good test for better players but still quite playable for those of us with less ability. Adding to its beauty, several of the holes are framed by attractive homes with well-kept lawns and lots of flowers. 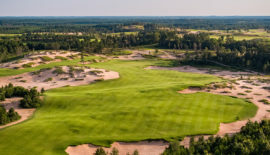 Five sets of tees are available at The Bluffs, measuring between 6,997 yards and 4,630 yards. Opened in 2006, The Wetlands Golf Course in Lafayette, just over two hours west of New Orleans, is a true public layout that offers five sets of tees and measurements between 7,293 yards and 5,025 yards. From any of the forward tees, the course is a hoot to play because of the generous fairways. The further back you take it on, however, the more you’ll learn how The Wetlands got its name. The numerous marsh areas are in play and ready to ruin your round if you don’t avoid them. Course management is the key to playing well at this fun layout. Two other “musts” if you’re visiting vibrant Lafayette: 1) dinner at the Blue Dog Café and 2) an hour or two at the Blue Moon Saloon on Wednesday night. That’s “jammin’” night for local musicians and it’s a blast. Gray Plantation Golf Club in Lake Charles, in the southwest corner of the state, is one of the best and most challenging courses on the Trail. Designed by Rocky Roquemore and opened in 1999, this very lovely layout is set on land nearby to the Calcasieu River. At first glance, Gray Plantation appears straightforward and simple. It’s not. 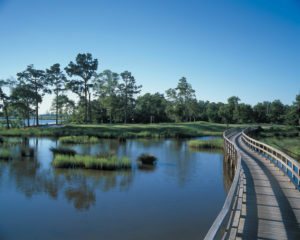 Lake Charles is home to Gray Plantation, one of the Trail’s very best. Like a siren’s song, the numerous risk/reward holes here will have you crashing on the rocks if you get sucked in. The fairways are wide at Gray Plantation, but so are the water hazards that frequently stand in your way. The putting surfaces are also good sized and, in places, well sloped. The straightaway par-4 18th, by the way — with the beautiful plantation-style clubhouse serving as a backdrop – is one of the prettiest holes anywhere. Four sets of tees are available at Gray Plantation, measuring between 6,946 yards and 5,392 yards. Atchafalaya at Idlewild Golf Club in Patterson, an hour and a half southwest of New Orleans, is named for the largest swamp in America. Nearby Atchafalaya Basin (pronounced “ut-cha-fa-lay-a”) measures 20 miles wide and 150 miles long. The basin is no country for old men. This golf course, however, is wonderful country for men and women of all ages — although it’s pretty long, too. 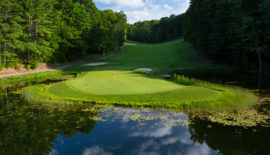 Designed by Robert Von Hagge and opened in 2006, this extremely attractive layout tips out at 7,533 yards and features a course rating of 76.4. That, kids, is sturdy. Thankfully, four other tees are available that measure between 7,032 yards and 5,263 yards. Not surprisingly, due to the numerous ponds and wetlands that come into play (hey, it’s swamp country! ), this course looks tight even from the “sensible” tees. 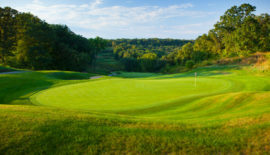 In truth, the fairways are wider than they look and the greens are accessible and very puttable. Don’t let its name give you pause. Atchafalaya at Idlewild — like the Audubon Golf Trail — is a really good choice. 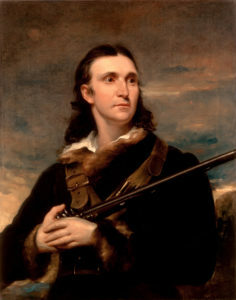 I have a feeling that if John James Audubon was around today, and had become a golfer, he’d be traveling the Trail and doing the same thing he did over 200 years ago: communing with nature … and looking for birdies. Roughly 30 miles south of Lafayette, on Avery Island, you’ll find the home of one of America’s most famous products: Tabasco sauce. Founded by Edmund McIlhenny in 1868 right there on Avery, the original red pepper sauce was created to liven up the bland foods of the post-Civil War era. An immediate hit throughout the country, McIlhenny was soon selling his product in places as far away as Europe. 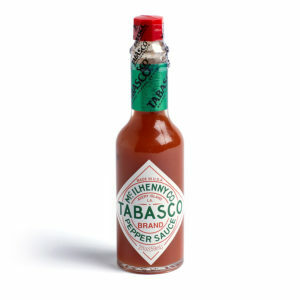 Still family-owned and operated, Tabasco today comes in eight varieties (including green) that offer tastes “from mild to wild.” In addition to the factory tour that’s available, the facility features a company museum, general store and restaurant. 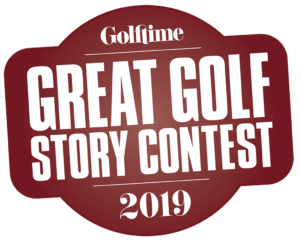 Visit audubongolf.com and audubon.org for more information.